How to get started on AWS? If you intend to deploy the Next Gen transit network for AWS, your starting point is this link.. For Azure Transit, this document is your starting point. This workflow provides you with a step by step instructions to build a Global Transit Network. While the instructions below reference AWS, it applies to Azure for preview starting release 4.1. For design guide, check out Transit Network Design Patterns. For more information, check out Transit Network FAQ. This Global Transit Network consists of a Transit gateway and a set of Spoke gateways for communications between Spoke VPC EC2 instances and on-prem network. For description purpose, gateway and GW are used interchangeably. Other than gateway deletion, resources created by this work flow should be deleted within the work flow. The Global Transit Network diagram is described as below. Identify a VPC, call it Transit VPC, in a region where you want to launch the Transit GW (additional details) We recommend you to use the information here to create a Transit VPC. Create a VGW or reuse an existing VGW. The VGW should not be attached to the Transit VPC if you plan to launch Transit GW in the same VPC. This VGW can be attached to a different VPC if this VPC CIDR is different from the Transit VPC where Transit GW is launched or in a different region and account. (see 10Gbps Transit Network use case). This VGW should be connected to on-prem either over Direct Connect or over Internet. If this is your first time using Aviatrix, make sure you go through the Aviatrix Controller on-boarding process to create Aviatrix account that corresponds to an IAM role. For instructions on how to launch an Aviatrix Controller, check out this link. Use Aviatrix “Create a VPC” tool with option “Aviatrix Transit VPC” to create a transit VPC that has all infrastructure fully populated. Open a browser and navigate to https://<Controller Public IP address>/. Once authenticated, click on Transit Network in the left navigation bar. Follow the steps below to set up Transit Network. The Transit GW is the hub gateway, it serves to move traffic between a Spoke VPC and on-prem network. The Transit GW must be launched on public subnet where its associated route table has a route 0.0.0.0/0 that points to AWS IGW. When selecting Transit GW instance size, choose a t2 series for Proof of Concept (POC) or prototyping only. Transit GW of t2 series instance type has a random packet drop of 3% for packet size less than 150 bytes when interoperating with VGW. This packet drop does not apply to Spoke GW. You can change the Transit GW size later by follow this instructions. When HA is enabled, a second Transit GW will be launched. Note both Transit GWs will be forwarding traffic in an event of tunnel failure between a Spoke VPC and Transit VPC, and between the Transit GW and VGW. For best practice, the HA GW should be launched on a different public subnet in a different AZ. To disable Transit GW HA, go to Gateway page and delete the Transit GW with -hagw in the name extension. Note if the Transit GW is connected to VGW, you cannot disable Transit GW HA and if there are still Spoke GWs, you cannot disable Transit GW HA either. Although the title says to connect to AWS VGW, Starting from Release 4.1, there are three options to connect to Transit GW with BGP to on-prem network. Choose one option that meets your network requirements. AWS VGW 1.25Gbps Active/Active 100 VGW should be detached. Use the instruction here to build encryption between VGW and on-prem router. External Device 1.25Gbps Active/Standby Unlimited VGW should be attached. Aviatrix Transit Gateway establishes BGP + IPSEC with on-prem router. CloudN 10Gbps Active/Standby Unlimited VGW should be attached. Aviatrix Transit Gateway established BGP + IPSEC with on-prem CloudN. “External Device” option allows you to build BGP and IPSEC tunnel directly to on-prem or in the cloud device. It bypasses AWS VGW or Azure VPN gateway for exchanging routes with on-prem, thus overcomes the route limit by these native services. For more information, read more here. Follow the instruction in this link to complete this Step. “Aviatrix Hardware Appliance CloudN” allows you to build BGP and IPSEC tunnel directly to on-prem Aviatrix hardware appliance. It achieves 10Gbps IPSEC performance and bypasses AWS VGW or Azure VPN gateway for exchanging routes with on-prem, thus overcomes both the performance limit and route limit by these native services. Follow the instruction in this link to complete Step 3. The instruction below is for Transit GW to connect to AWS VGW. Before executing this step, a VGW must have already been created. Select the VGW ID in the drop down menu, Customer gateway will be automatically created as the result of this step. This step automatically builds a site2cloud IPSEC tunnel with VGW and establishes a BGP session with VGW to exchange routes between on-prem and the cloud. You are responsible for building the connection between VGW and on-prem. The connection is either over Internet, over Direct Connect or both. We support two patterns of connections: Detached VGW and Attached VGW. Attached VGW is only allowed if VGW and Transit GWs are in different VPCs. Currently, only one connection is supported on a specific transit gateway/vpc, regardless of any of three options above is chosen. Note Aviatrix Transit GW can connect to a VGW that belongs to a different AWS account in a different region. It takes a few minutes for the VPN connection to come up and routes from VGW to be propagated. When the IPSEC tunnel with VGW is up, the Controller admin should receive an email notification. If you login to AWS Console and select service VPC in the region where VGW is, you should see Customer Gateway and VPN Connections have been created. Do not delete or modify them from AWS Console. These resources are deleted when you Disconnect VGW at step 8. You can check if routes are properly propagated by going to Advanced Config at navigation bar, select BGP. Select the Transit GW, click details. The Learned Routes should be the list of the routes propagated from VGW. Scroll down to see the total number of learned routes. You can enable NAT function on Spoke GW if egress to Internet is intended to go through the Spoke GW. Once NAT is enabled, you can further configure FQDN whitelists for egress filter. This step attaches a Spoke VPC to the Transit GW Group by building a Aviatrix encrypted peering and transitive peering between the Spoke GW and the Transit GW. The Controller also instructs the Transit GW to start advertise the Spoke VPC CIDR to VGW via the established BGP session. To attach more Spoke VPCs to this Transit GW Group, repeat Step 4 to Step 6. This step detaches one Aviatrix Spoke VPC from a Transit GW Group. The Controller also instructs the Transit GW to stop advertising the Spoke VPC CIDR to VGW. Note the Spoke GW is not deleted and you can go to step 6 to attach the Transit GW group again. To delete a Spoke GW, go to Gateway on the main navigation tab, select the gateway and click Delete. Repeat step 4 to 6 to add more Spoke VPCs to the Transit GW group. You can view the network topology by going to the Dashboard. Click on the Map View to switch to Logical View. In the Logical View, each gateway is represented by a dot. You can rearrange the initial drawing by moving the dot, zoom in or zoom out, move the graph around. After you are done moving, click the Save icon. You can remove Transit GW connection to VGW via this step. You can go to Step 3 to build the connection again. Under Advanced Config on the main navigation bar, click BGP. The Transit GW will have BGP Mode as Enabled. Click the Transit GW and click Details to see Advertised Networks and Learned Networks. Learned Networks are network CIDR blocks that BGP learned from VGW. Advertised Networks are Spoke VPC CIDRs. You can also click Diagnostics. Select one of the show commands or type in yourself if you know the commands to see more BGP details. To troubleshooting connectivity between a Spoke VPC instance and a on-prem host, follow these steps. Go to Gateway page, locate the Transit GW with “-hagw” in the gateway name extension, highlight the gateway and click Delete. Note Transit GW and its back up companion are in active/active state, that is, both gateways could be forwarding traffic. To disable Transit GW HA, it is best practice to make sure there is no traffic going through the backup Transit GW. There are multiple resources to help you automate Transit Network setup. Noteif you are building a Transit Network following the workflow, you should use the APIs documented below. Transit Network section in API doc. Aviatrix Controller AMIs can be found on AWS Marketplace. Try out our Aviatrix Secure Networking Platform PAYG - Metered with two free tunnels. Follow the Startup Guide to launch the Controller instance and get started. The above workflow abstracts and combines multiple existing Aviatrix features, such Encrypted Peering, Transitive Peering and Site2Cloud to bring you a wizard like experience so that you do not go to multiple pages on the Controller console when building the Transit network. After you have built the Transit GW and Spokes, you can view the connection between Transit GW and VGW on the Site2Cloud page. You can also see the Spoke to Transit GW connections on the Peering page. 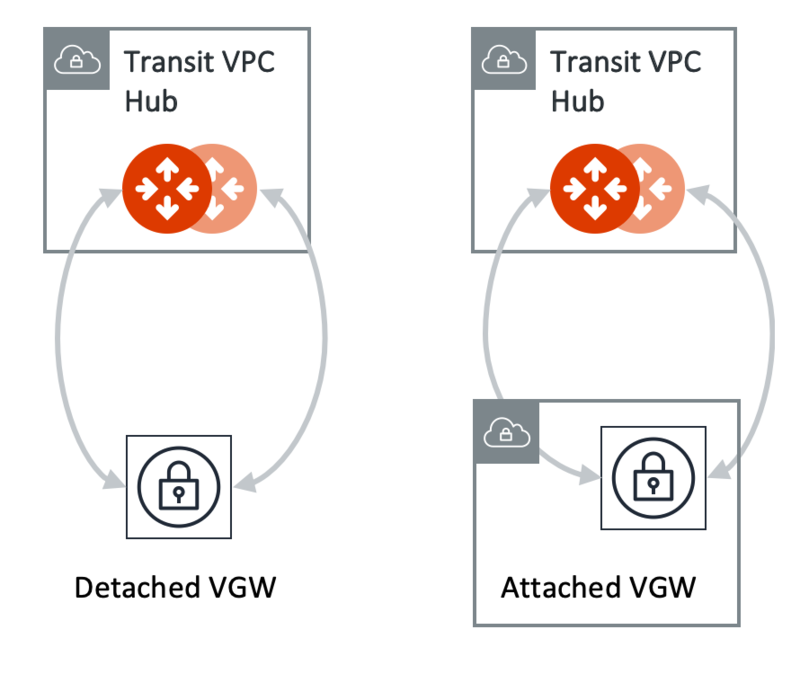 Stay on the Transit Network page for any Spoke gateway and Transit GW actions, such as attach a Spoke, detach a Spoke, Connect to VGW and Disconnect to VGW. Do not go to any other pages for these actions. For deleting a Spoke gateway or Transit gateway, go to the Gateway page, select the gateway and delete.